A Kestrel flew down from the trees on Buck Hill to catch grasshoppers and moths in the grass. There is a game of rugby going on in front of it, but it takes no notice at all. Birds know when people are busy, and therefore posing no threat, and to them a rugby ball is a slow moving object easily dodged. 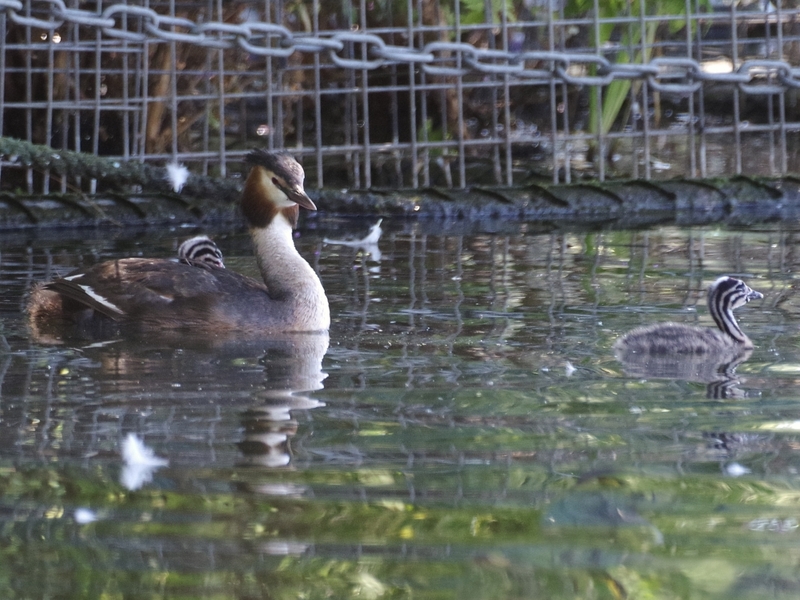 The Great Crested Grebe family from the fallen poplar brought their four chicks out into the middle of the Long Water to catch fish for them. 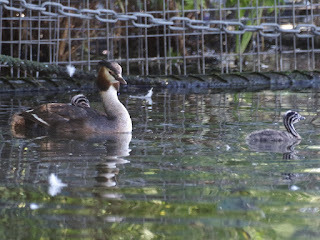 The new family on the Serpentine with two chicks were in the same place at the west end of the island. 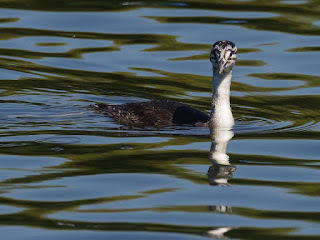 The three young grebes from the family near the bridge were fishing by themselves. 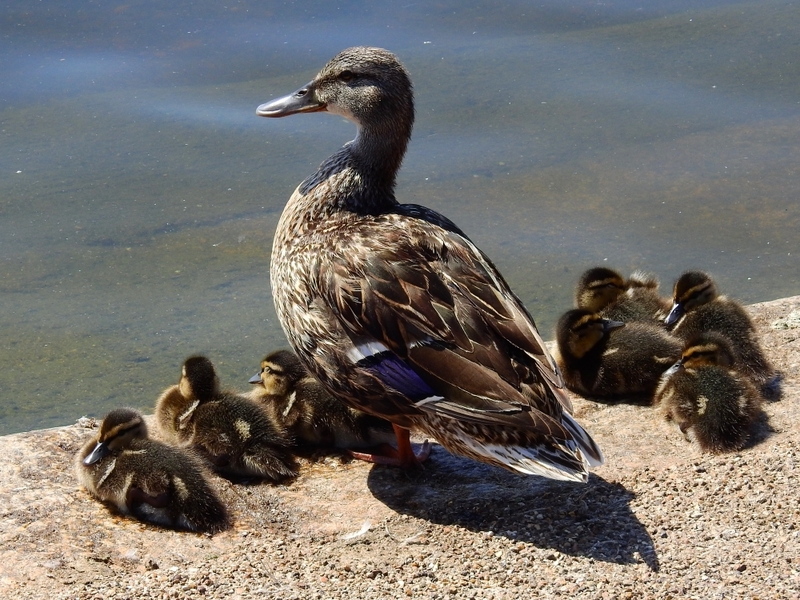 Their parents are still feeding them, but it's good practice. 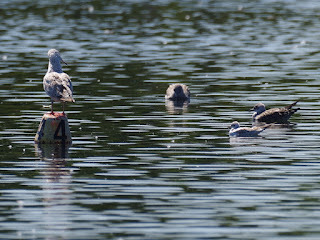 Not surprisingly, I didn't see them catch anything. 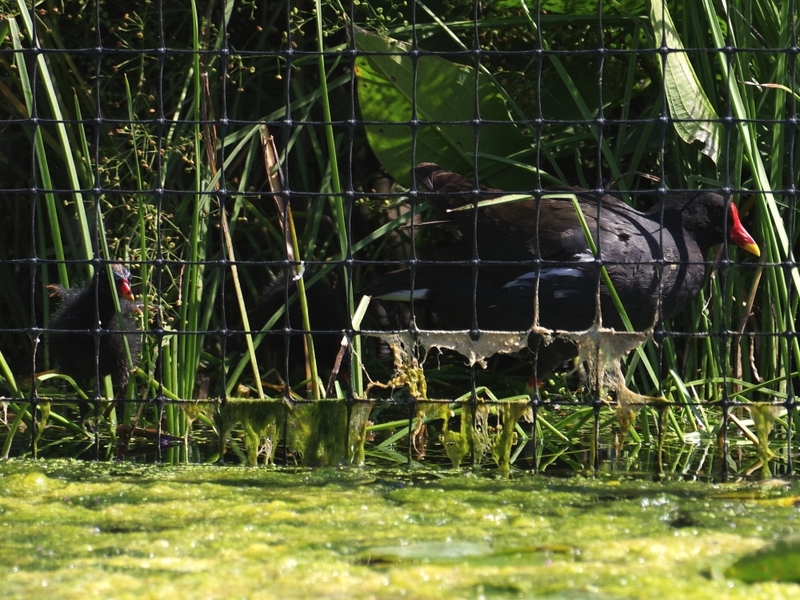 The Moorhen chicks in the Italian Garden were kept safely behind the netting surrounding the clumps of plants. A Grey Heron waited for a fish and a family of Coots wandered around under the jets of water from the marble fountain at the edge. 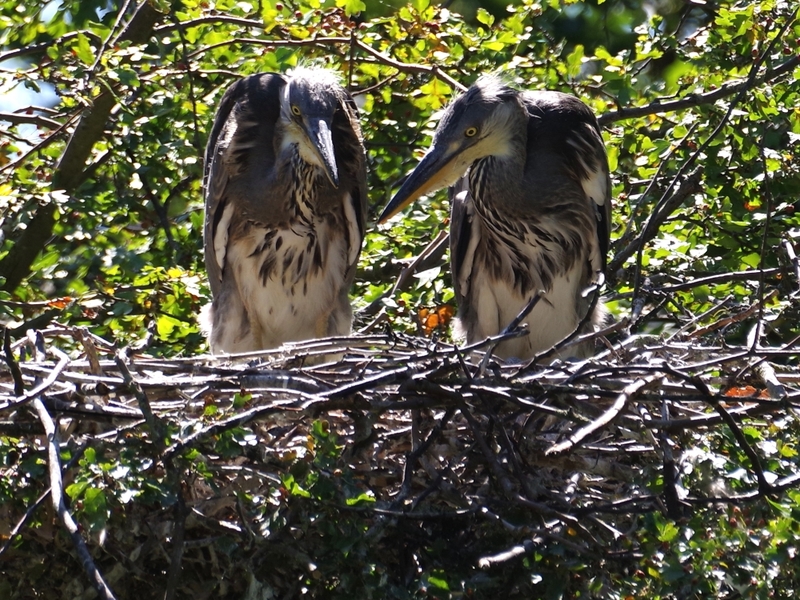 The young herons in the nest on the island were also waiting patiently, both for a parent to bring them a fish and for the glorious moment when they can fly out of the nest where they have been penned up for so long. 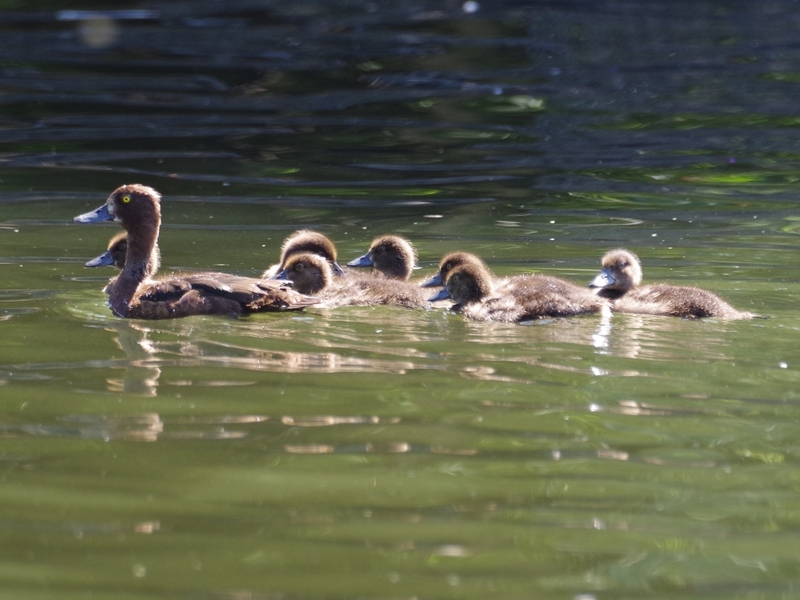 A Tufted Duck took her seven ducklings along the edge of the lake to the chained-off area in front of the island where they wouldn't be disturbed by all the pedalos churning around. 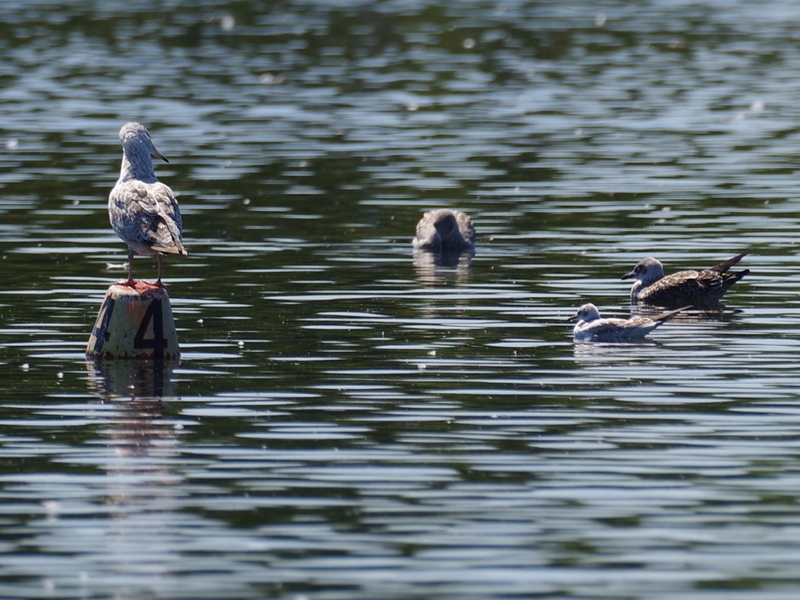 ... in spite of several Herring Gulls waiting in the middle of the pond. 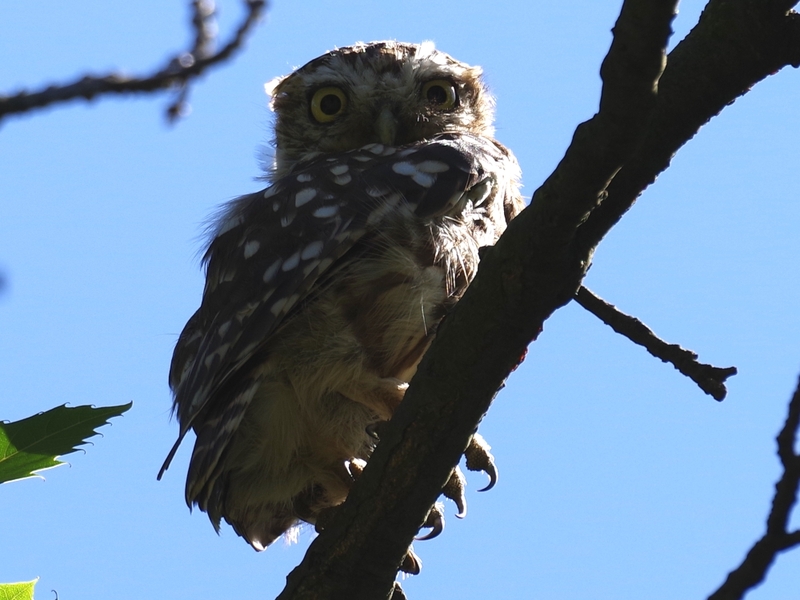 The Little Owl isn't spending much time in a visible place in his chestnut tree, and it usually takes several visits to find him. Although Little Owls live around the Mediterranean and even in the desert, like any other birds they can get too hot. 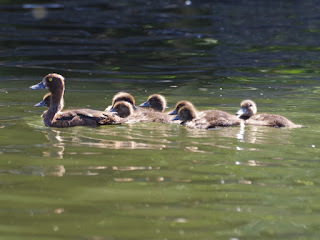 A shoal of young carp swirled about in the shallow water in front of the Peter Pan statue. A Latin band provided raucous Sunday afternoon entertainment in the Hyde Park bandstand. I'm not a very good judge, but I'd say that Latin band sounds remarkably well. I am quite amazed by the remarkable hunting technique of the Kestrel. 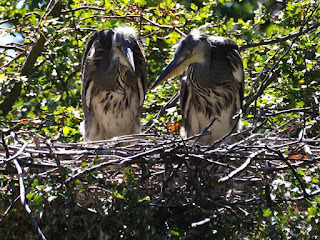 Whenever I see them hunt they tend to hover quite kite-like over their prey, and then swoop swifty down on it from a height. By the way, the grass looks so parched and dry - I hope there is green everywhere else. The grass is looking pretty parched everywhere. We had rain a few days ago which briefly added a tinge of green, but this is fading. If you are using an anti-tracking add-on such as Ghostery in Firefox, you need to set it to 'trust' this site to allow the making of comments.